Tonight was the inaugural practice session of the St Michael’s church male choir and it was a resounding success. 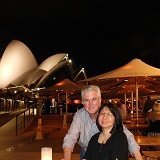 Last night Linda and I went to see the David Williamson play “Travelling North” at the Riverside Theatre, Parramatta. While the north of Australia is recovering from massive flooding, fierce firestorms have killed more that 173 people, destroyed nearly 800 homes and burnt out 350,000 hectares in the southern state of Victoria.